Throughout the year each class will be participating in the Daily Mile at least once a week in addition to our normal PE activities. Research has shown that it benefits physical, emotional, social and mental health and wellbeing. Please view the presentation below to find out more about how we are incorporating the daily mile at Highfield Infants' School. The Daily Mile has numerous benefits to children, whether they run, jog or walk. The 15 minute break from lessons is invigorating and leaves children (and teachers!) more focused and ready to learn. The time spent outside, in all weathers, helps children become better engaged with the outdoors and aware of their surroundings. 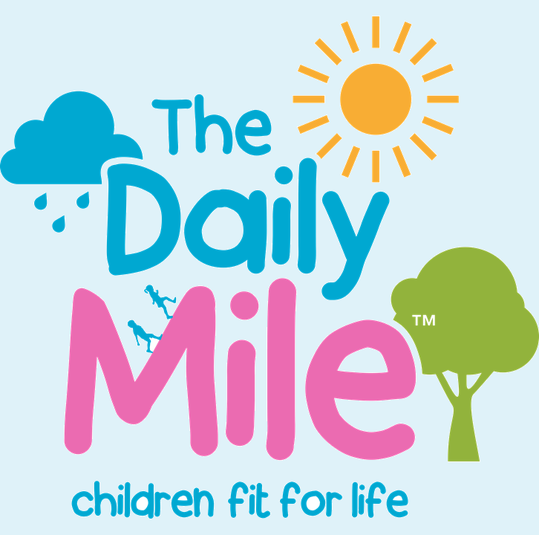 The Daily Mile builds self-esteem and confidence, improving children’s perception of exercise for life. The Daily Mile is critical to reducing childhood inactivity and obesity. Children are getting fatter, younger, and we need to stop this in its tracks. Early scientific studies show that the level of obesity at St Ninian’s School is around 45% less than the national average.